Zimbabwe soldiers are placed where police are clashing with protestors over fuel hikes in Harare, Jan. 14, 2019. Violent protests erupted in Zimbabwe's two largest cities after the government announced a massive fuel hike. 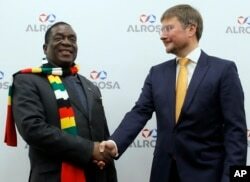 Zimbabwe's President Emmerson Dambudzo Mnangagwa, left, and CEO of of the Alrosa diamond mining company Sergey Ivanov shake hands during their meeting in Moscow, Jan. 14, 2019. Mnangagwa on Monday defended the decision at the start of a five-nation tour. "Zimbabwe is going through both political and economic reforms and these do not come easily," he told reporters in Moscow. "It will take time for things to settle and results to be shown." He said the fuel price hike was necessary because local fuel was the cheapest in the region. Mnangagwa, who took power after longtime leader Robert Mugabe was forced to resign in November 2017, is trying to win back foreign investors sidelined under Mugabe.